Beat together egg whites, vinegar and salt until almost stiff but not dry. Gradually add sugar and beat until stiff. Spread meringue over bottom and up sides of a pie shell (the many layers are why you should use a deep dish pie pan) Bake in 325 oven 15-18 minutes until lightly browned. Melt chocolate chips over hot, not boiling water, beat together room temperature egg yolks lightly. Thoroughly blend yolks into melted chocolate, add water and mix well. Spread 3 -4 tablespoons of the chocolate mixture over the cooked and slightly cooled meringue. Chill remainder of chocolate until it begins to thicken and set aside. Beat together cream, sugar, and cinnamon until very thick. It’s the week of pies, this is the week when we ignore our scales, put on our stretchy pants and ride a pie train into the ultimate dessert nirvana. We literally have dozens of pies to choose from as you plan your Holiday feast – but first, we need to break down for you the most essential part of every pie, which is the crust. Pie crust is something bakers are passionate about, maybe even to the point of controversy, the battle of the pie fats is alive and well and in the twocarolines.com kitchen we are leaders of the Crisco crust gang, but we don’t want to fight you, we just want to hang out and eat pie with you. Here’s the crust Joyce King made famous that both Caroline’s can make blindfolded. It’s fairly easy, consistently delicious and as long as you keep your Crisco supply in check, you will always have these ingredients around. I will often make 3 at a time and freeze two of them all rolled into a pan and crimped so all I need to do is take them out and fill them with something amazing. Obviously double this if you’re doing a double crust pie. Mix up your salt and flour. Add Crisco and cut it in with a pastry cutter, or with this handy mix and masher tool I use all the time. Should look like shaggy crumbs at this point. Add your water and continue to mix in with your tool then get all the dough off of that with a rubber spatula and with that spatula continue to pull the flour off the sides of the bowl and press it together until you take it with your hands and mix it into a nice play-dough-ey ball. It should be malleable, not too dry but not sticky. Press your dough ball into a disk on a floured surface (I like to work with a little bit wetter dough and dry it with my rolling surface flour). Keep working with your hands until you have a nice circle, throw a little flour on top of that. Take your rolling pin, and start rolling your dough out into a large thin circle. It helps to have a cover or pastry sleeve on your rolling pin so your dough doesn’t stick. We like our crust nice and thin. You may need to cut around if your circle is wompy and fill in or take away until your dough is in a fairly even circle. Pull up one edge onto your rolling pin and slowly roll your dough around the rolling pin then roll it out with about an inch over the sides into your pie pan. Next, use kitchen shears to cut where you have excessive hangover and feed that into areas where your crust looks too close to the edge. Then fold your edges under into a ridge and crimp as desired. Be sure when you crimp to press your crust up on the edge of your pan so it doesn’t slip down the sides when you bake it – this is particularly important for a blind bake. Fluted or wavy crimp is the easiest, but I also enjoy a triangle crimp which is achieved by pressing your thumb from the inside of your pan into the edge and meeting it on the outside with your index finger and thumb of your other hand. Don’t be afraid to get creative, there are loads of fun crimp instructions online. But we will be posting our own soon. Check out Facebook page for immediate crimping help. A quick note on blind baking. Pies that do not bake such as cream pies or fresh fruit pies need a crust that is already baked or “blind baked” – in this case, we recommend poking lots of holes in your crust with a fork which will prevent bubbles. You can also bake your crust with pie weights or dry beans in parchment, but we find the hole poking method to work just fine. This crust is easy to bake alone, in a 425 degree oven, bake on the top shelf for about 7 minutes or until your crust is a nice light golden brown. If your crust slips into your pan use gloves and a clean dish cloth to push back up. Let cool before filling. I shared this pie almost a year ago as a guest post on one of my friends blogs, but I’ve shared it MANY times with friends for various events and just whenever I want to eat one of the most delicious bakes in my arsenal. I had to post it here today because so many friends have been asking for the recipe with Thanksgiving less than a week away! This pie not only checks all the boxes, crunchy, chewy, chocolatey, nutty, sweet, salty, mouth melty…it also makes the people you serve it to think you’re a total genius in the kitchen. The cool trick is that it’s one of the easiest pies I make, and honestly, the only pie that competes with this for my favorites is chocolate cinnamon mousse, but that’s a much more involved pie so granola pie has become my go to. It’s really good served warm, but I think it’s even better served cold, it’s amazing on it’s own, but heaped high with whipped cream or ice cream and you are winning all the pie awards this year. I implore you to add it to your Thanksgiving line up and share this recipe with your pie loving friends! Crust: unbaked 9″ Traditional pie crust – ours is easy and always delicious! I sometimes make this in a deep dish pie pan in which case I just go heavy on all the ingredients – you can’t really mess it up I promise! Prepare pie crust by pressing into pan and crimping as desired. I usually put my unbaked crust in the freezer while I prepare the filling which makes it extra flakey. Preheat oven to 350. In large Microsoft waveable bowl melt butter, stir in brown sugar and corn syrup until blended. Beat in salt, vanilla and eggs. Stir in crushed granola bars, walnuts, oats and chocolate chips. Pour into crust lined pan. Bake 40-50 minutes or until filling is set and crust is golden brown. During last 15-20 minutes of baking cover crust edge with strips of aluminum foil to prevent excessive browning (if you don’t want to bother, it’s not a huge deal). I use a pie shield that’s handy for pies that have a long bake time. Cool at least 30 minutes before serving. Tastes great warm, room temp or chilled with whipped cream or ice cream. Cover and refrigerate any remaining pie, but remaining pie is unlikely. 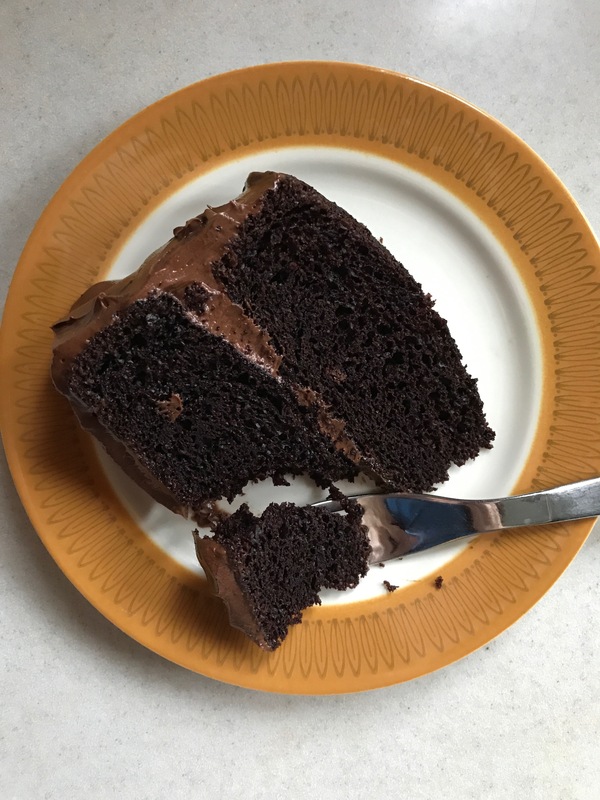 There are so many cakes and other chocolate bakes that use coffee, and I’m sure they taste great, but the fact that I don’t drink coffee should not keep me from experiencing these desserts, so I decided to take a famous cake, and experiment with using herbal tea instead, the results were incredible! This is my take on Ina Garten’s (The Barefoot Contessa) Beatty’s Chocolate Cake. This cake has awesome reviews and it looks and sounds so good, I just had to eat it! Instead of coffee, I steeped 2 bags of Zhena’s Gyspy chocolate chai tea and poured that into my batter hoping it would impart some cool flavor, and it DID! If you have no hang-ups with coffee, you can use that, or even just hot water, but I loved the undertones of chai and red tea that came through with my brew! 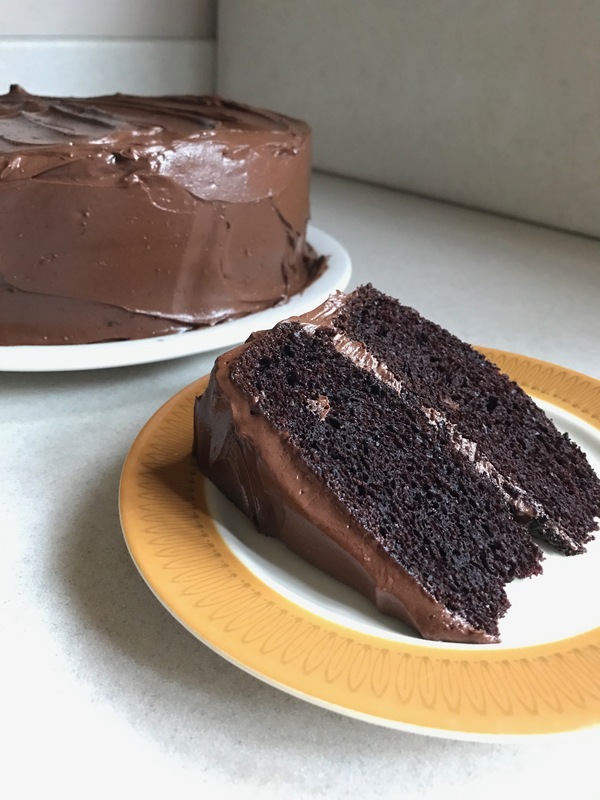 The frosting calls for instant coffee powder, so there again, I used some creative tricks and came up with a very rich and super chocolatey frosting by dissolving special dark cocoa powder instead. I don’t know what Ina’s frosting tastes like, but mine was super rich deluxe and so so SO delicious! Take out your butter for the frosting if you’re making the same day so it will be room temp. Preheat oven to 350. Grease and parchment line on bottom 2 8 inch cake pans. I had only 9 inch, which worked great, I just watched for doneness and they were done at closer to 32 minutes than 40. Always check for doneness, not bake times. Put the flour, sugar, cocoa, baking soda, baking powder, and salt into the bowl of an electric mixer fitted with the paddle attachment and mix on low until combined. Get your hot tea steeping so it’s rich with flavor while you do these next steps. In another bowl combine the buttermilk, oil, eggs, and vanilla. With the mixer on low speed, slowly add the wet ingredients to the dry. With mixer still on low, add your hot tea and mix until just combined but be sure to take a spatula around the bottom of the bowl to incorporate all the ingredients or you’ll get an uneven batter that’s too thin or too thick. Pour batter into your prepared pans as evenly as you can and bake around 30-40 minutes (depending on size of your pan) until a toothpick or cake tester comes out clean. Cool in the pans for 30 minutes then turn them out onto a cooling rack to cool completely. For the frosting, chop up the chocolate and melt it either using a heat proof bowl over simmering water, or my preferred method, in a pyrex in the microwave on defrost so it never gets too hot. Do this first and set it aside so it has time to cool because you don’t want to put hot chocolate into your butter or your frosting can get a bit sloppy. Next, in the bowl of an electric mixer fitted with paddle attachment, beat the butter on medium-high speed until light yellow and fluffy, about 3 minutes. Add the egg yolk and the vanilla and continue beating for 3 minutes. Turn the mixer to low, gradually add half the confectioners sugar, then beat at medium speed, scraping down the bowl as necessary, until smooth and creamy. Dissolve the dark cocoa powder into the water creating a thick paste. On low speed, add the chocolate and the cocoa paste to the butter mixture then add the rest of the confectioners sugar adding more if needed to get a workable texture. 2 cups was about right for me, and the frosting was just beautiful to work with and so shiny and pretty. Place 1 layer cake flat side up on a flat plate or cake pedestal. With a knife or offset spatula, spread the top with frosting then put the second layer on top, rounded side up and spread frosting evenly on the top and carefully over the sides of the cake making sure to touch your spatula only to the frosting and never to the cake so you don’t drag crumbs. It’s November, and I’m hungry for pie every day. Toasted Coconut Cream Pie is such a special dessert, it’s really not very difficult, but it feels elegant and special. I like to paint my crust with chocolate which puts it totally over the top. There is just mind blowing flavor and the chewy toasty coconut bits make it have incredible texture. It’s hands down one of my favorite pie experiences and I’m going to need to bring this to my November pie line up for SURE. A cool bonus is that once you learn this recipe you have the foundation for pretty much all my cream pies. I use it for banana cream pie, strawberry cream pie, chocolate cream pie, and more! Seriously guys, stop being intimidated by pie, it’s really fun, easier than you think, and such a joy to eat and serve. You have a Caroline or two here for you every step of the way. Blind bake your crust, ours takes about 8 minutes in a 450 oven on the top rack. Use either pie weights or poke loads of holes (that’s the twocarolines method). You want it nicely browned on edges and if it slumps a little just use a tea towel to reshape while it’s hot. Keep your oven on but turn to 325 to toast coconut. Melt your chocolate and teaspoon of coconut oil in a pyrex or heatproof bowl. I prefer to do this in the microwave on defrost power so it never gets too hot. If you don’t have a defrost setting melt 20 seconds at a time until chocolate starts to loose its form then let it sit and add a few seconds at at time until you can whisk it smooth. Spread your chocolate into the crust of your baked pie crust painting up on to the sides halfway and all across the bottom. Let this cool while you make your filling so the chocolate gets hard. Set oven to 325. Spread out 1 1/2 cups shredded sweetened dried coconut on a baking sheet for about 8-10 minutes stirring a few times until it’s got some nice color and smells amazing. Set aside. Put sugar, cornstarch and salt into a medium/large heavy saucepan. I use this all clad one, anything decent sized with a good thick bottom will work. Vigorously whisk in your egg yolks one at a time until no yellow streaks remain. Stirring constantly with a heatproof rubber spatula, bring to a simmer over medium heat. Remove from heat once bubbles come up and scrape down the corners of your saucepan and whisk until smooth. Return to heat and whisking constantly, bring a simmer and cook for 1 minute. Take off the heat and whisk in your butter, vanilla and coconut extract. Pour about 1/3 of your filling into baked pie crust, layer with coconut and another 1/3 of your filling alternating and ending with coconut on top. If you’re topping your pie with whipped cream save some coconut to put on top of that. Chill for a good 4 hours before serving. This pie keeps nicely in the fridge for a good 5 days or so. Recipe adapted from Joy Of Cooking vanilla cream pie. If your name is Caroline King, there’s a good chance you have a serious chocolate addiction. We won’t pretend we are the only ones “afflicted” with this “problem” so let’s just say that this is the latest in super rich, dense, chocolatey satisfaction. I can’t remember how I came across this recipe, but I’m so glad I did. It’s slightly adapted, but significantly delectable. Lightly spray and line a 9×5 inch loaf pan with parchment, leaving the ends long so you can lift the cake out for slicing after it has baked. Whisk the dry ingredients together. Sift the cocoa powder to get rid of any clumps. Set aside. Whisk the sugar and eggs together until pale and smooth. Beat in the butter and vanilla, then fold in the zucchini. Blend the dry ingredients into the wet, in three stages, blending just until incorporated after each addition; careful to not over-beat. Fold in the chocolate chips and spread the batter into the prepared pan. Bake for 50-55 minutes, until a toothpick inserted near the center comes out clean. Cool completely on a rack before frosting. To make the ganache, heat the cream to a simmer, then pour over the chocolate chips. Let sit for 3 minutes, then stir until glossy and smooth. Refrigerate until cooled and spreadable, stirring every 10 minutes until desired thickness (for me, that was approximately 25 minutes). Once spreadable, frost the bread. The recipe makes a LOT of ganache, so I frosted the sides as well.